That’s right… this is not a test. 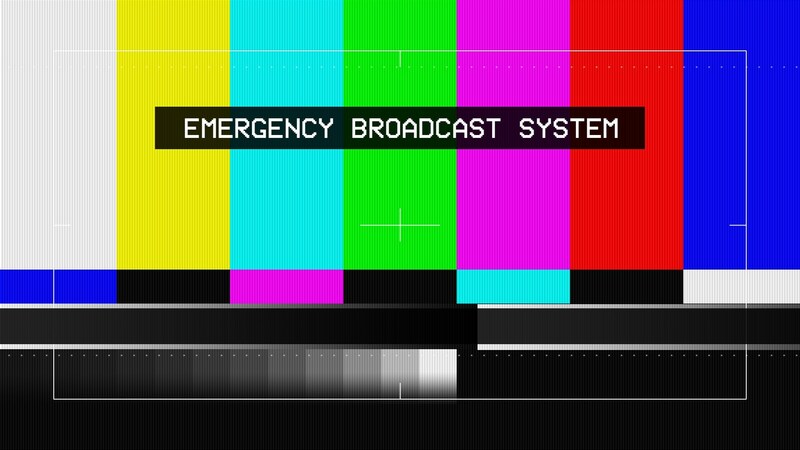 In the wake of the recent “election,” for those who have not yet succumbed to the normalization of an apocalyptic TRUMPian post reality, we now prepare to activate the Emergency Broadcast System. The EBS will insure an expeditious method of communicating directly with the American public and the world, a people’s warning system that travels through the network far and wide to signal events over the next four years of grave national and global consequence. These extraordinary times of impending crisis require a tactical alert mechanism that resonates defiantly and purposefully. The EBS is a refusal to be assuaged by any seduction of normalcy as the TRUMP Administration burrows its way into the seat of World Power as a viral contagion without a cure. We have made the urgent decision to activate the Emergency Broadcast System and sound the alarm each and every time there is an imminent attack on our collective nervous system, whenever toxic levels of propaganda and conspiratorial disinformation reach a dangerous threshold, and in the event that Orwellian doublespeak erodes America’s already tenuous grip on reality. With the complete and total failure of the mainstream media to adequately broadcast a warning that might have prevented the country from being duped by a master showman of reality television, we now declare at the top of our lungs: we must be our own media! The Emergency Broadcast System is a streaming megaphone for broadcasting words and actions of our own creation independently as a powerful act of individual expression, without a filter, without rules, without the FCC. EBS is a space for online activism, a virtual occupation of the Network for liberating reason in the Age of TRUMP. Via the emergent social broadcast media of Facebook Live, the EBS is an empowering act of collective transmission, instantaneously and globally. We will inaugurate the Emergency Broadcast System as a signal of rapprochement in the immediacy of the broadcast: for some a beacon of positive hope, and for others, a guided missile of angry catharsis. And what will be the nature of an EBS alarm signal? How will it sound? How will it convincingly communicate that yes, we really do still have a voice in a crumbling democracy? The instructions are simple: arm your mobile device, focus your camera, prepare a monologue, invent an action, & shout to the network. No, this is absolutely not a test.